Is is possible that with a corset the non-corseted dress will fit about the same? I'm so confused about what to do! Thanks! Try the non-corseted dress with a corset, if at all possible. FWIW, I think the non-corseted dress is pretty, and I feel like the ruching on it will be more flattering than the beading on the corseted dress. I'm between 2 dresses at DB too - same scenario (one corseted and the other not) and I really want a corset. The consultant I was working with was able to have one of the seamstress look at the dress and show me how it would fit with the corset and also showed me the different bustle options for each dress. I'm pretty sure I know what dress I want of the two, but there's a bridal show this weekend, so I want to look at the Spring styles coming out before I make up my mind. 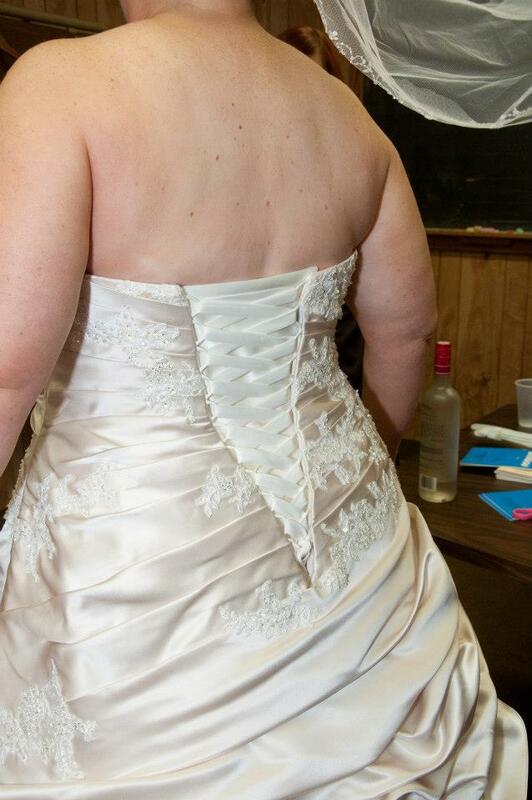 I bought my dress at DB and had it converted from a zipper to corest and loved how it turned out. They did a great job and you would never know it wasn't originally a corset back. This it the dress I got (I did get a plus size dress) and what it looked like after I had it converted to a corset back. Hope this helps. @Erikan73 - That's one of the dresses I'm considering (but changing it to a corset back)! @Dignity100 - my dress is a size 20 and I'm selling it. If you are interested let me know. Erikan73, thanks! The dress looks great, so I am more confident about that option now! Dignity100, it is so hard to pick when you can't see the actual finished product. I considered trying another store, but I am not sure what I would find for $800 or less? I will go back and ask them to show me what the dress would look like with the corset and maybe bring one, if I can find an cheap one. Urbaneca, both dresses have some ruching, but the non-corseted has more. I actually look thinner in the beaded, but I think it's due to corset and size. Thanks though. The bow is the one I want, but I want to feel body confident. @CrazyCatBride, you might have some luck going to a bridal shop that carries plus size lines. I found my dress for $999, but tried on sample they were selling for $450. Silver0319, thanks for the tip! I was scared to go and have them say not only am I too fat to try gowns on, but I'm too broke also. I will email a few and see.Thanks! Try Alfred Angelo signature stores or stores that carry Mori Lee's julietta line. for $800, your options will be limited, but both of those designers have gowns in that price range. Thanks Queerfemme! I do love the Julietta line, just haven't found anyone nearby that carries it yet and also didn't think I could afford any of it. I do have an AA signature store nearby. That's not a bad idea. I ordered my dress and it has a corset back, I may change mine to a zipper. I would say to do what you like the best, either will work well with your theme. Edit - I see that someone else already posted BBP website. My bad ! 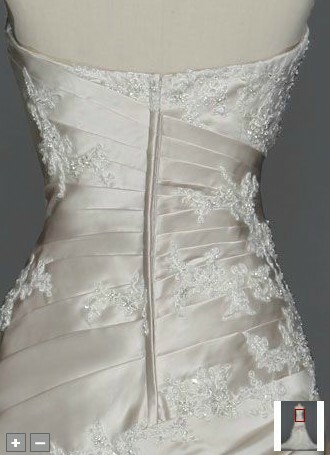 PS - I was going to change a davids bridal dress from zipper to corset, and they were going to charge $150.00 to do that. So, keep that in mind when you are pricing things out. Great tips, thanks!! Tradesy may work if I can find a tall bride or unused gown. Great ideas. I feel better that I have options. Now maybe something will excite me. Btw QueerFemme, I love the photo!! I always thought I wanted a dress with ruching. In the end, I found it made me look heavier, not thinner! It just added bulk. you would be suprised at the discounts you can get at a regular bridal salon and not those big chain stores. the trick is to find out what designers you like in terms of dress styles, a bonus is if they carry a line specifically for plus size brides find out what salons in your area have these designers and call them up and see if they have any discontinued samples that they have for sale.